A digital marketing ecosystem involves research and development for integrations. Today we’d like to show you the latest results: the dynamic catalog and Vtiger connector for synchronizing MailUp with your external CRM. We consider research into integrations a fundamental part of our job, and one which allows us to offer companies more and more effective tools for creating a digital ecosystem exclusively for marketing activities. How? Through the development of connectors that let different systems communicate with each other, synchronizing the information in each one. 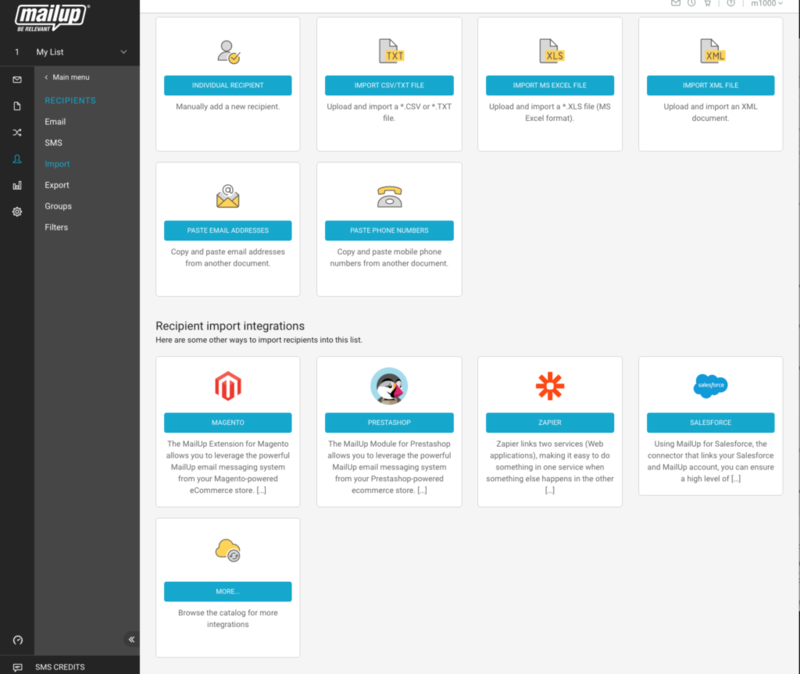 In the section Settings > Account settings > Integrations, you’ll now find a dynamic catalog that offers you all the key information regarding the available integrations. This dynamic catalog lets you see the integrations and filter them by category, price, and keywords. All the information comes from each manual’s dedicated page and provides details about its benefits, operation, installation, and price (if any). 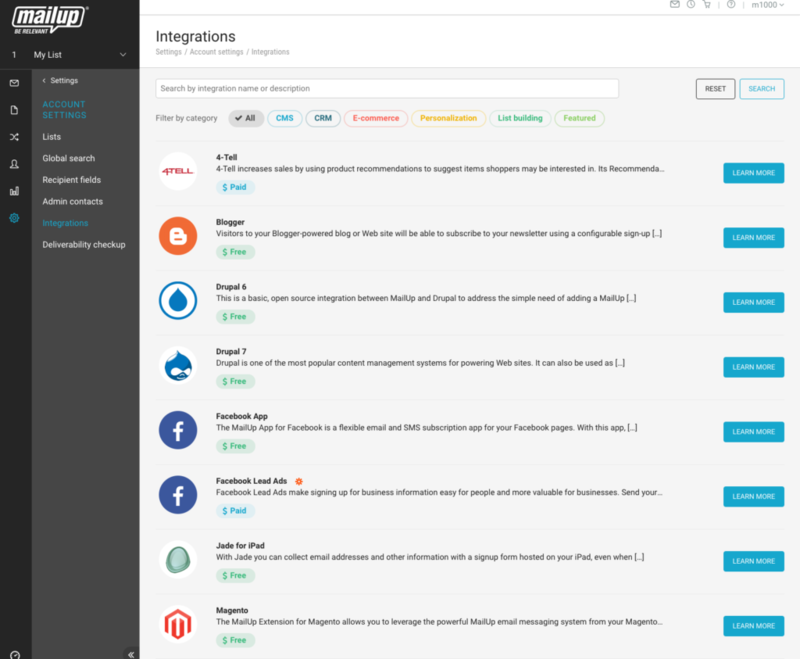 The content has been reorganized to show you an overview of the connectors that let you natively integrate MailUp with external systems: this allows us to rapidly give you the answer you need, but also to indicate useful tools for further expanding your digital ecosystem. 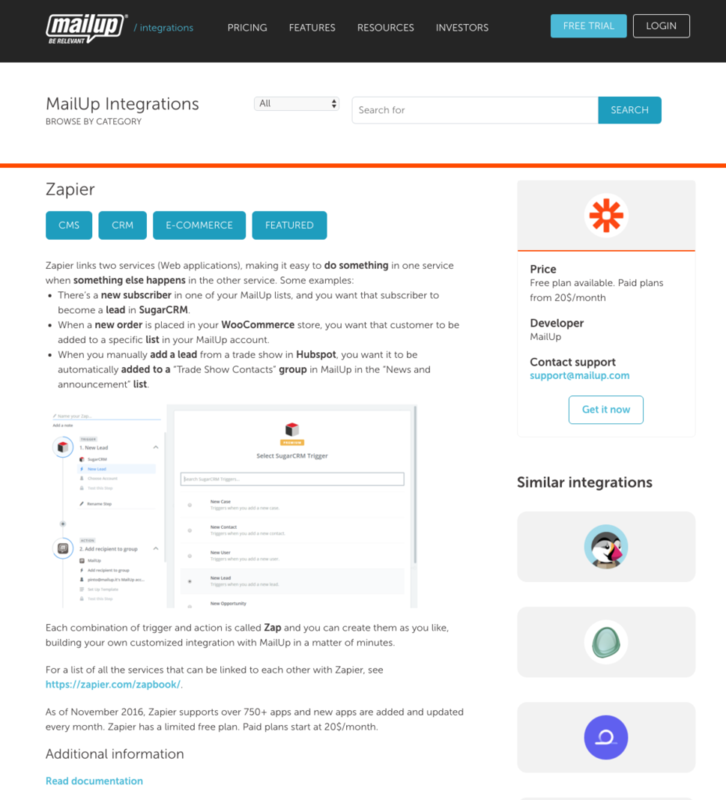 In this regard, you can also consult MailUp-integrated applications through Zapier and other similar services that connect cloud applications to each other. The new catalog offers the most useful integration related to the section of the platform you’re working on: this means that MailUp will suggest the integration that’s most related to your tasks based on the functional area you’re in. An example is shown in the screen below: while working on the contacts “Import” page, connectors related to this page are recommended. We certainly aren’t the first to discover the importance of CRM. This enormous digital environment allows for the immediate management and extraction of information pertaining to an individual recipient. The new MailUp-Vtiger CRM connector creates a fundamental link that renders information-sharing immediate between a Customer Relationship Management system and the MailUp platform Email and SMS marketing tools. The new connection module allows you to manage email campaigns directly from a CRM system, automatically adding contacts to the MailUp platform. All you have to do is indicate the selection criteria for your MailUp lists: every new contact added to the CRM system is automatically sent to the correct list and synchronized with your MailUp account. What happens when, on the other hand, a contact no longer meets the selection criteria? The connector can automatically remove it from the list. The result? Always up-to-date sending lists on the platform, without having to manually upload, import, or export anything. Integration lets you send tailored, customized emails to customers. Would you like to set up a new product launch campaign for a specific customer segment? You can extract the list of all the customers with the desired features through a CRM report and automatically channel them into a MailUp list that’s ready for sending. Offer customers what they need. Let’s say a customer contacts a company’s customer support to request some technical information: thanks to the statistical reports of campaigns sent with MailUp, the customer’s data can be seen in the CRM system and immediately show you whether he or she has subscribed to the newsletter, which newsletters have been opened, and which links were clicked on. This makes it easy to propose products and services that the customer is actually interested in. Let’s consider a company that wants to develop a structured activity to re-engage non-active customers. connection and synchronization of the “sideline customers” list with the “sideline customers” report. In doing so, each time the CRM system updates aspects in this customer list, the MailUp list will receive the same information to update its lists accordingly. This is a key step for the brand in question, which by doing so can directly create and launch its campaigns in MailUp without having to extract or manually search for the selected recipient segment. And which external system do you integrate the MailUp platform with? Tell us what tools your digital ecosystem is composed of in the comments below.